Two years ago today I started writing In Erika's Kitchen. As I say to my husband every year on our anniversary: Feels like a lifetime. And I mean that in only the most positive sense. Blogging has become such an integral part of both my routine and my persona (online and in real life) that I hardly remember what I did with my time before it. All of the things listed above have meaningfully improved my quality of life over the past two years. But what's changed most of all is that I've met dozens of new friends through this blog - too many to list, that's certain. Some are friends with whom I spend a lot of time and who have become part of my family's routine. Some are friends I haven't yet met in person but to whom I feel just as connected through Twitter, Facebook and mutual blog comments. To those of you who are reading this but have never let me know who you are: Thank you. I'm grateful for the time you spend here and look forward to getting to know you in the future. And to those of you I do know: Thank you, too. You have made my life considerably more rich in the past two years. I feel lucky. Okay, no more sappy stuff. Enough of what you've done for me. Now here's what I'm going to do for you. * U.S. residents only, please and sorry. I have no idea how I'd ship any of the above out of the country successfully. Happy Anniversary Erika! So happy you love to blog because it is such a pleasure to read and indulge in. Happy birthday to Erika's blog! How cool that you got to interview Alice Walters! I love hummus recipes and can't seem to get enough of them! Happy Birthday! What a wonderful post Erika and I couldn't agree with you more on the what did I do with all my time BFB (before food blog)! But as you so eloquently expressed you wouldn't have it any other way and neither would I. I'm so glad I've gotten to meet you and spend a little time with you. Really looking forward to more of the same and so glad to be a part of the group you launched. Anyhoo - Congrats on 2 wonderful years and here's to many, many more! Oh darn it! I forgot to tell you what recipe I'd like to see next year...I would love to see an amazing dinner roll recipe. Sounds simple but my husband would just love it and I haven't found a recipe I like yet. Happy Birthday to your blog! I agree, knitting wouldn't quite have the same effect on your life. Hmmm, a recipe I would like to see? How about something with your pie crust, now that you've conquered your fear of it. A great suggestion...french canadian tourtiere. It's a meat pie that is so delicious, I highly recommend it! Ah ha! I have it... since Carolyn has asked for something made with your pie crust. How about a lamb pot pie of sorts? Happy Birthday to your blog! I am SO impressed with how far you've come with your blog, all of the different events/opportunites you've experienced are just incredible. You truely are talented. Not only are you talented but you're so kind. I can't tell you how much I've been enjoying your blog. I just started blogging at the end of August/beginning of September and already I know how you feel, I can't imagine my life without my blog or even what I did before my blog (even though it's been a short time for me). You are so incredibly sweet for having a giveaway. I would love to see you make a recipe with the Meyer Lemons from your tree. I was so intrigued when you said you had a meyer lemon tree because we don't have lemon trees in Oregon. :) But of course anything you make next year will be amazing! Happy Birthday to your blog, Erika! I relate to your sentiments above and happily, we've been able to meet in real life. I'd love to see a recipe for stews of some kind, e.g. beef bourgignon (sp? ), but for summer eating vs. winter. A lot of folks are buying beef or pork etc. in bulk from a farm and wondering what to do with some of the roast, stew, or other random cuts year round. Hi Erika! Those two years just flew by, didn't they! Happy Blogiversary to you, and thank you for paying it forward by opening your heart, home and friendship to some newbie bloggers like myself. In the next year, I would LOVE to see a handmade frest-cut pasta recipe with anchovies (and other stuff). Sounds a like a warm, hearty meal you and I would both love!!! Congratulations on your 2 year anniversary! I'd love to see a great (easy) seafood stew recipe. Happy blogoversary! What a ride you had your first 2 years! Keep it up...your site is so fun and interesting to read, and your contribution to the food blogging community has been huge. I would like to see you post something ethnic from your past, or a heritage recipe from your family (either side). I always enjoy those posts. Happy Anniversary! I am so glad that I found your blog...you have brought me so much joy, and I love the recipes that you share with us, week after week. Even though we've never met, I feel like I know you! As for a recipe in 2011? I would love an updated version of a pot pie. Thank you for sharing with me today. Have a splendid Saturday and Sunday! Your blog is great. I would love to see a Tourtiere recipe, or some kind of interesting version of meat pie! Happy anniversary! I also love that you delve into your heritage. You've done Passover recipes in the past, and I would love to see more this coming Passover. Happy, Happy Anniversary!!!! I wish you many, many more!!! Congratulations, Erika! Blogging for two years is not a small achievement. But blogging as successfully as you did counts for much more. I am so happy I met you at Sippity Sup's party, and I am looking forward to getting to know you better. Happy Anniversary, I met you at the FoodBuzz festival and remember you mentioning your Meyer Lemons, I was so jealous. In Montana we get great beef but lemons...no way! Lemons are one of my favs! I'd love to see more recipes with them...how about a risotto? Or a soup? Glad you started blogging! oh my gosh, i took a knitting class two weeks ago and it's all i think about doing every night! get a chef's "famous" recipe. then, make it your own or reinvent it somehow. so two recipes in one post, kind of like amanda hesser's redux column. 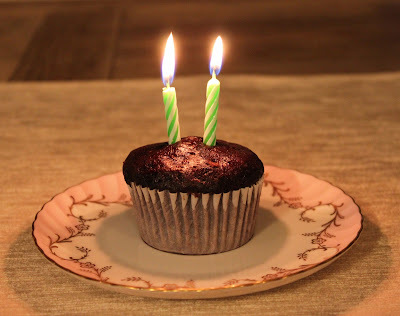 Can't believe it has already been 2 years....happy, happy Blog Anniversary!!!! I have my eyes on those magical meyer lemons of yours. My tree doesn't produce as many as yours and you know I love fresh fruit martinis. I would love to see a great recipe for an easy crispy duck. I have tried to make duck a few times and all the work hasn't been worth it! Congrats and you deserve all the great things coming your way. You truly are a Rock Foodie Goddess! Hi Erika, Congratulations to you and your blog. I think you may just turn me into a cook if I keep reading it. (No small task!) I made your applesauce yesterday for a late chanukkah celeb. Delicious! And so easy. Keep it coming! Happy Blogiversary!! So many neat things you experienced. I was honored to have met you at the camp blogaway! those all sound deeelish :) How about something with lamb? Happy Birthday to In Erika's Kitchen! You've been an inspiration to us all! I received some fabulous blood orange curd as a gift and would like to see what recipe you'd create using this wonderful curd. I've enjoyed reading your blog very much. Once you made a hungarian something or other. I think I'd like to see more not so American desserts/sweets. That's my kind of post! Biggest congrats to you! The time does fly, this is true. Ever made a croquembouche (or even just cream puffs)? That could be fun! Congratulations on the two-year anniversary! I wouldn't say there's a particular thing I'm craving, but I do enjoy reading posts about dishes that have some meaning. Whether it be something from your heritage, something a dear friend or family member made with you, or something you created that just spoke to you. Great stories behind those! I'd love some brownies :) brownies are my favorite and I'm sure yours are delicious. Happy Blog Anniversary! I don't have anything in particular in mind for you to make, everything you make looks fabulous! Congratulations!!! You have accomplished so much in two short years - and I would say your photography has gone from "not bad" to "good"!! Hmm... I am with Carolyn - I would love to see Canadian Tortiere on your blog!! As for what I would choose should I be lucky enough to win.... brownies!!!! We love you and we love Erika too!! You (the blog) are wonderful to read whenever I need a short break or "refresher" during the day and I like all your mom's personal touches (and appreciate that your mommy, Erika, that is, is tactful and classy enough to know just how much personal info to put on your face). I also love that everything on your face looks so gorgeous, fresh, bright, and yummy.
. . . As for what would be nice to see in 2011? Hm . . . I would like to see a couple of easy but gourmet (your mom knows how to do both easy and hard gourmet) dishes and, specifically, gourmet vegan dishes that are first and most importantly great tasting and only secondarily vegan. How about an Asian angle -- e.g., a great noodle bowl / stir fry / rice and something-or-other thing or perhaps a really yummy curry dish?? I know your mom can do it, and I would trust her to do it well. Erika, Congratulations! 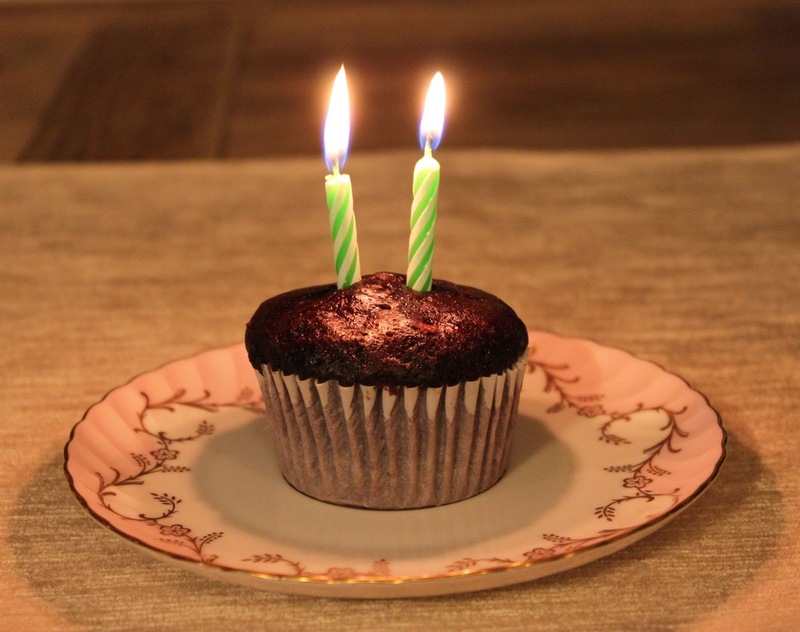 Happy second Blogiversary!! Your accomplishments are inspiring. As for what I'd like to see more of....it would be easy to just say more of your yummy recipes, because that's easy, since they are all so good, so instead how about persimmon cookies? ;-) Again, congrats! I am going to say I would love to see more recipes by your sons! I loved reading those entries!!! And the winner is....Lindsay @ Gingerbread Bagels! (Thank you Random.org for helping with the selection.) Thanks to all of you for the wonderful ideas. I'm already working on the list! And thanks for being my blog buddies!